Sometimes the surprises from Oregon’s offense come from a natural evolution and progression against the defenses of the Duck opponents. This time we see a new play introduced (or a variation of one used in the distant past) due to the game plan of Oregon; in this case against the Colorado Buffaloes. I could list off a number of plays that might be pulled out of the playbook from the past to confuse the opponent, but I did not anticipate seeing the Sprint-Draw play! Let’s take a look at this interesting play and the reasoning for introducing it. A pre-snap alignment we’ve seen before … power play? 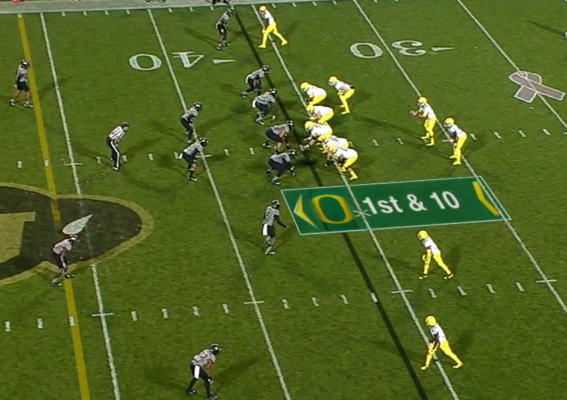 Above, the Ducks are lined up in a typical alignment: two wide-outs to the left, one to the right, and an H-back on the right. Nothing unusual so far. In fact, I thought this was a power play as it unfolds. The Grizzled Ol’ Coach corrected me — thanks Mike! 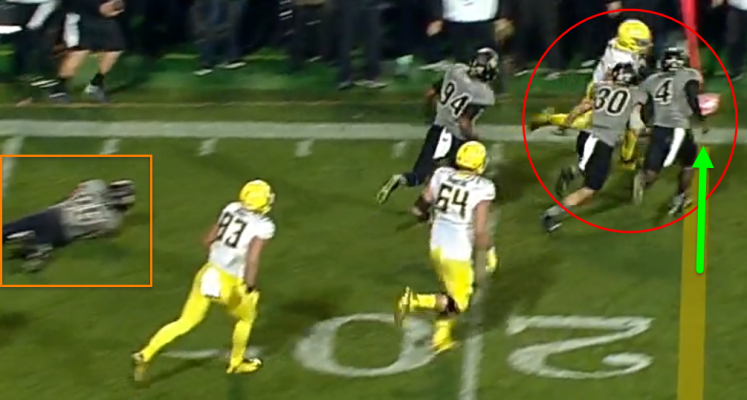 Notice in the photo above, with the ball arriving in QB Taylor Alie’s hands, he and RB Royce Freeman are making their first step to the left (see feet circled in red). It looks like they are taking the ball left. Alie’s head is even turned left. Going left? Why the growing hole between the center and right guard? As Alie and Freeman sell the play left (feet circled above in red, again), the H-back is jamming into the hole that the line is creating. It appears the H-back is targeting the linebacker on his side. 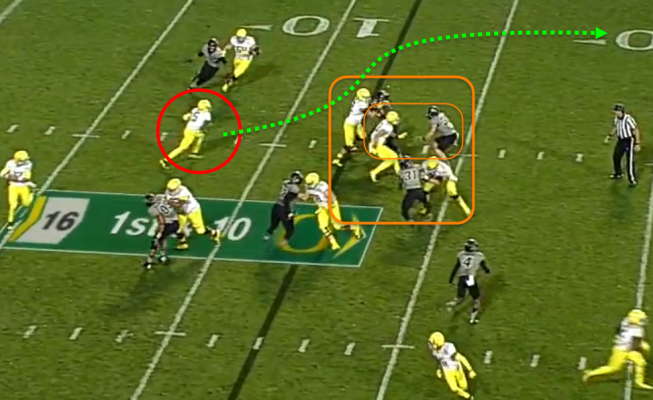 Also note that Matt Hagarty, the center, is engaged with the nose tackle whose head is watching the gap on the right. The poor defensive end on play-side is getting double teamed. But is that the play-side? 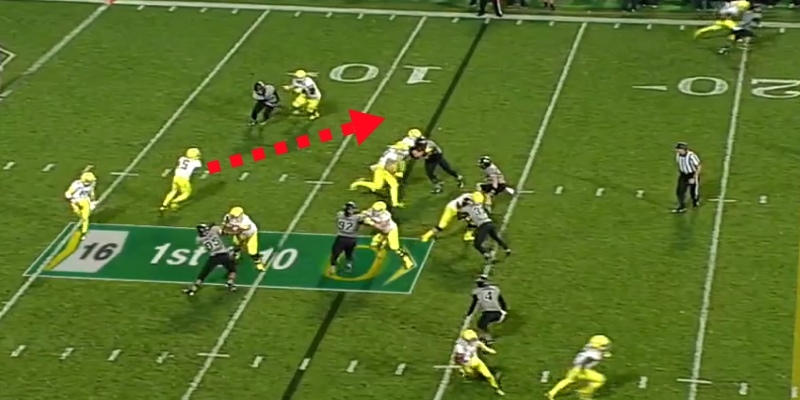 Tyrell Crosby has his man controlled (light green circle above). 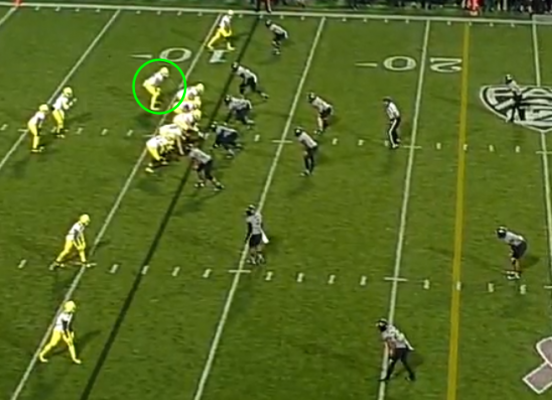 Jake Pisarcik is standing up his defensive end (yellow circle). 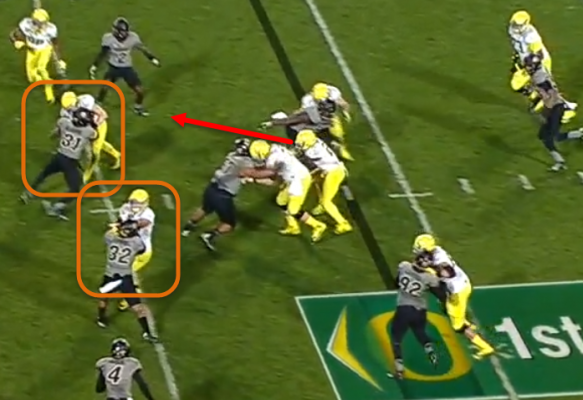 The H-back, Evan Baylis, has a head of steam built for the linebacker (dashed orange arrow). 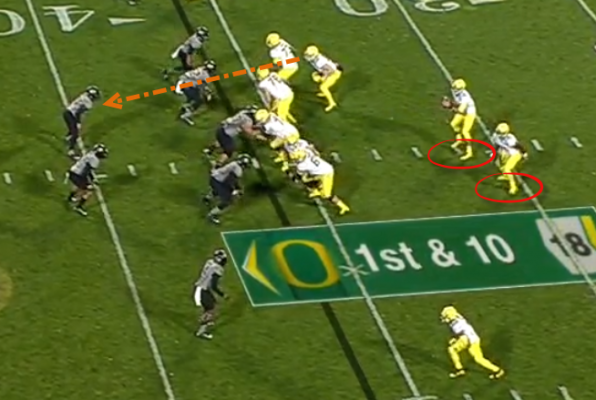 The nose tackle has moved his head to the apparent play-side of Matt Hagarty just at the right time (red oval). Royce switches direction and Taylor hands-off the ball. The gap is large (green dashed line above). The H-back is blocking the linebacker, (orange rectangle) and Freeman is headed for the hole. Royce is in the hole. Look at those downfield blocks! 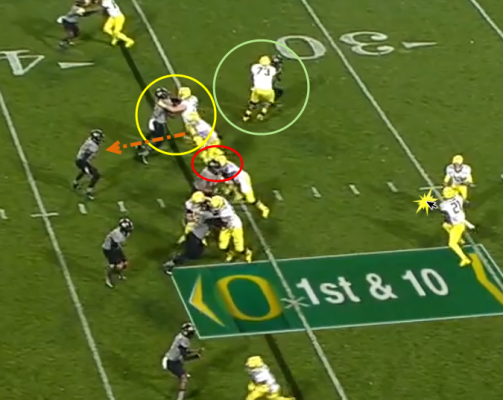 Both linebackers are engaged (orange rectangles above). Freeman is in the hole for what becomes a good gain. A nice play that complements the roll-out passing game. One way to protect your inexperienced quarterbacks is to introduce plays that will slow down the pass rush! The pre-play alignment shown above is the mirror image of the sprint draw, though the H-back (green circle shown above) is just a wee bit left of the position in the example above. 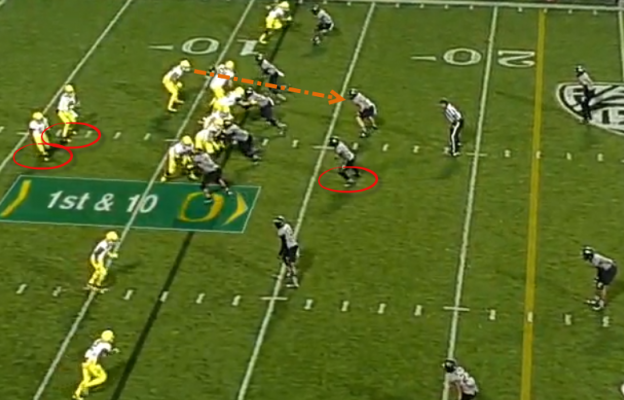 Again, both Alie and RB Taj Griffin are stepping to their right (feet circled in red). Notice how the linebacker on the right is also stepping that direction. The hand-off has occurred and Griffin has the ball, heading to his left. Above, the slot receiver to the right is circled in green just to point out this play could be adapted as a pass (the slot is headed out to the flat and gets wide open). But this play is about Griffin running left. 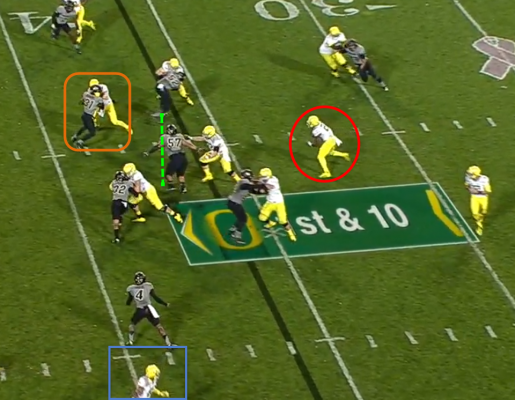 The linebackers were sold that the play is to their left (blue arrows showing where they’ve moved from). They are adjusting now. Griffin is headed for that big hole. Two out of three contain blocks are working well as seen above in the orange rectangles. The linebacker to that side (inner orange rectangle) won’t get blocked by the H-back, though Griffin’s speed makes that moot. Griffin flying for a first down! The result of this Sprint Draw is even more successful than the first (see Griffin reaching a first down, red circle/green arrow). 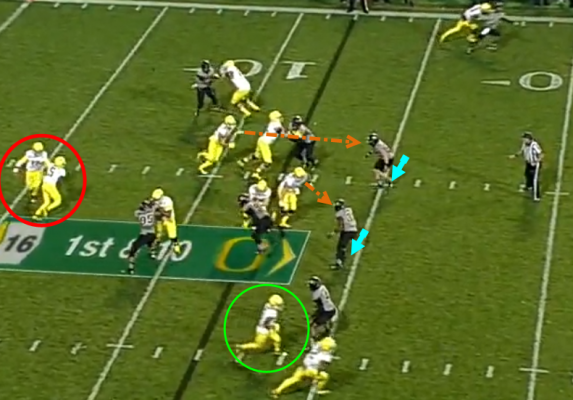 The Ducks have had challenges at QB and leaving the pocket gives them a good view of downfield action. The Sprint Draw starts out looking like a move to get the QB out in the open, with a running back leading to block. The Buffalo defense bought that premise both times as the Duck coaches anticipated this and make the play into an unsuspected draw play. Griffin has become “Mr. Outside” with the Oregon rushing attack. 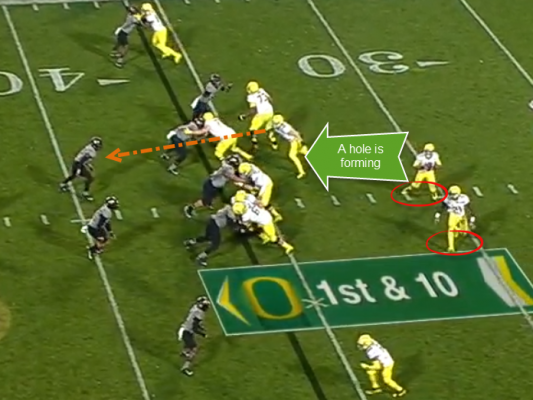 We have always examined the successful plays in Oregon football and their impact upon the game. Many people in recent weeks began to wonder specifically what technique problems we are having and how we can, as fans, learn from it. From now on we will also examine plays that did not work, in order to see what went wrong and why and what to look for in the future. I feel it will make us appreciate the great plays better and make us more knowledgeable as fans. We will not be singling out players or coaches, as that is not our style. We will refer to the “cornerback” or “safety” as an example, without names. They will get better over time, just as we will improve as fans in our understanding of some fine points of the game. So — when we lose a game? You may see the killer plays that did us in and why they worked so well. I wish it were another way, but since our charge at this site is pondering and learning the game? This is a fine way of going about it.